While you're probably aware that the slaughter of dogs (and cats) for human consumption is legal in countries including China, South Korea and Viet Nam, did you know it is also legal in 44 U.S. states? That's right. The only states that prohibit the dog and cat meat trade are California, Georgia, Hawaii, Michigan, New York and Virginia. Fortunately, to ban this cruel trade nationwide, the Dog and Cat Meat Prohibition Act of 2017 has been introduced by U.S. representatives Alcee L. Hastings (D-Fla.), Vern Buchanan (R-Fla.), Dave Trott (R-Mich.) and Brendan Boyle (D-Pa.). It would be an amendment to the U.S. Animal Welfare Act. "The fact that this legislation is even necessary today is astonishing," Boyle said in a statement. "It is past time for us to outlaw such a cruel and barbaric practice once and for all." 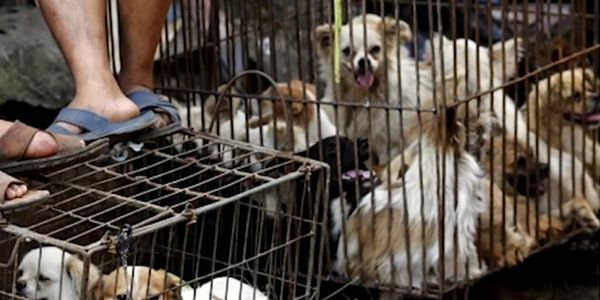 The United States should set an example for the rest of the world by outlawing the dog and cat meat trade. Please sign this petition urging your representative to pass the Dog and Cat Meat Prohibition Act of 2017. As someone who cares about the welfare of companion animals, I urge you to vote in favor of the Dog and Cat Meat Prohibition Act of 2017. While other countries have banned the cruel and barbaric slaughter of these animals for human consumption, it continues to be legal in 44 U.S. states. The Dog and Cat Meat Prohibition Act would ban the purchasing, shipping, transporting, selling, or donating of dogs or cats to be slaughtered for human consumption nationwide, and impose penalties on anyone who does so. As Wayne Pacelle, president of the Humane Society of the United States said, it is imperative that the United States prohibits the dog and cat meat trade so it will not expand and "we send a signal to the world that we are taking action against the trade here at home." Please take action by supporting the Dog and Cat Meat Prohibition Act of 2017.